Elisabeth Cummings (b.1934) was raised and educated in Brisbane and holidayed at her family’s retreat at Currumbin on the Gold Coast. Her parents collected art and as a child she and her brother would visit the Queensland Art Gallery, where her father was a trustee, on Friday afternoons to attend Vida Lahey’s art class. In her final year of high school she became determined to study art and, with the encouragement of her teacher, decided to attend the National Art School in Sydney. She moved to Sydney and studied under Douglas Dundas, Wallace Thornton, Dorothy Thornhill, Godfrey Miller and Ralph Balson between 1953-57. In 1958 she was awarded the New South Wales Travelling Art Scholarship which enabled her to travel to Europe where she lived in Italy, France and England. She also travelled to Salzburg and studied under Oskar Kokoschka at his School of Vision. After a decade of living in Europe, Elisabeth Cummings returned to Australia and settled in Sydney. She commenced teaching at the National Art School in 1969, instructing countless students there during her thirty year tenure as a lecturer and exhibiting regularly in Brisbane and Sydney. In 1970 she started camping on a property at Wedderburn on Sydney’s outskirts, owned by Barbara & Nick Romalis that was eventually gifted for the purpose of establishing permanent art studios. Later she built a studio residence and has been primarily based there since, along with other artists including John Peart, Roy Jackson, Joan Brassil, Su Archer and David Fairbairn. In 1994 devastating bushfires destroyed her home, which was subsequently re-built and sits on the edge of a gully surrounded by trees and rocky outcrops. Elisabeth Cummings’ work has not only been inspired by this picturesque environment, but also from her extensive travels throughout Australia from the coast to the desert. She was the subject of a major survey in 1996 by Campbelltown Art Centre (which toured to the Gold Coast City Gallery) and has continued to present exhibitions of important works since that time. This survey exhibition focuses solely on her landscapes however greater examination of her oeuvre accompanied by a major publication is long overdue. Join Owen Craven as he discusses a painting expedition he led to Fowlers Gap with Elisabeth Cummings and 12 other prominent Australian artists. The artists’ response from this expedition will feature in an upcoming S.H. Ervin Gallery exhibition Not the Way Home. Join Randi Linnegar for a floor talk as she discusses the spectacular landscape works of Elisabeth Cummings. Join master printmaker Michael Kempson as he discusses the prints of Elisabeth Cummings. 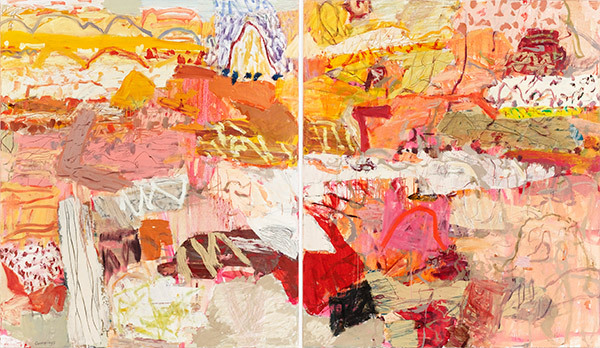 Join two of Australia’s leading artists, Elisabeth Cummings and abstract painter John Peart as they discuss their art practice in the idyllic bush environment of Wedderburn. Join two of Australia’s leading artists, Elisabeth Cummings and David Fairbairn for a behind the scenes look at the creative community at Wedderburn.